Established in 1990, Steen Icelandic Horses is a 12 acre farm located near the town of Slocan in the beautiful Slocan Valley, British Columbia. We breed, raise, train, promote and sell Icelandic Horses. TTEAM/TTouch Training, riding lessons/clinics, starting young horses and farrier services are available on site. Upon arrival you are greeted with the sight of a large comfy log home and spacious post and beam barn. Picturesque corrals and pastures are surrounded by the forested majesty of the Valhalla and Selkirk Mountains. Bordering the farm is a beautiful Rail Trail with excellent footing, river views and a bird sanctuary. This trail runs the length of the Slocan Valley and ends at nearby Slocan Lake, a stunning spot with a gazebo for picnics and beach access for the horses. An outdoor grass arena provides an area for schooling, with stalls and small pens for initial handling and halter training. A riding and sleighing track connects with miles of trails and dirt roads. Tammy Steen is a level II TTEAM Practitioner who has worked with accomplished instructors Robyn Hood and her sister Linda Tellington-Jones (TTEAM), Sue Faulkner-March and Olga Comeau (Centered Riding), Peggy Cummings (Connected Riding), Diddi Bardarson (Icelandic champion), Christine Schwartz (trainer and author), Richard Crossley (combined driving) and Joni Lynn Peters (eventing). Tammy’s teaching is a unique blend of teaching methods that reflects her genuine interest in offering a successful, cooperative and humane way of learning the equestrian arts. Many of her clients enjoy pleasure, trail and family horses. Starting these types of horses is her specialty. Tammy’s trademark is to produce horses that are soft, supple, quiet, willing, happy and capable of thinking their way through a variety of complex situations. Inquiries use contact page for email or use mail or phone. The breeding herd consists of mares chosen for their easy tolt, exceptional character and willingness. 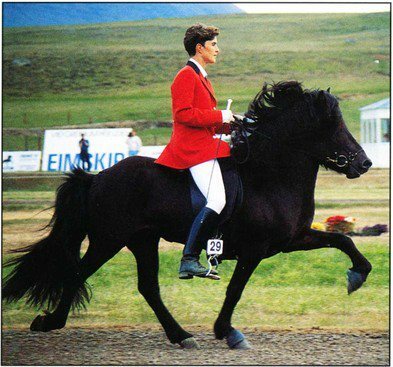 Top breeding lines include Orri fra Pufu, the current Icelandic sensation; Segul fra Stora-Hof, top import from Iceland; Lettir fra Ey, known for producing elegant, easygoing horses with exceptional gaits, and the legendary producers Rafn fra Holtsmula, Bjorgford fra Hvanneyri and Bylur and Hordur fra Kolkuosi. Our breeding herd consists of mares chosen for their easy tolt, exceptional character and willingness. Sales are backed with a suitability guarantee.